The power plant is an early model 340 cu. in. Mopar ( 400 + HP ) with aluminum intake and long tube headers. The exhaust is run through a pair of Turbo mufflers and the pipes exit under the rear bumper at a 45 degree angle. We just had a Mustang II front end placed under it this past year and at the rear is a 9 in. Ford. The ratio is 3.56 according to the tag on it. I have a stock dash ( black w/ silver glitter ) with the original bezel but built a gauge cluster behind it with some old Stewart Warner gauges ( black face w/white numbers ). I also put some ''73 Monte Carlo bucket seats ( They are black & swivel ) in last year. The door panels and carpet are also black. The headliner is gray and a stock replacement. The Plan is to change some of the things from BLACK to GRAY, like the carpet and door panels. Way TOO MUCH BLACK for south Texas and NO air- conditioning. Most of the work that has been done on this car was by myself and a good friend of mine, Bill, who was very instrumental in finding many of the parts that we installed or modified to fit this project. 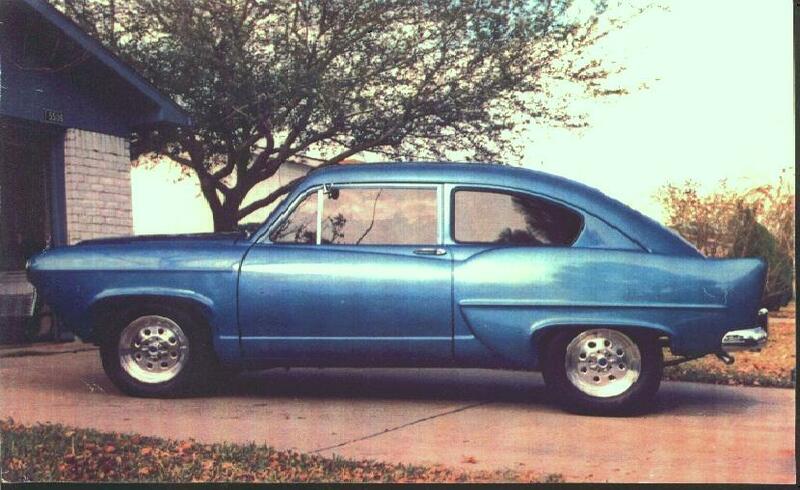 ( THIS WAS AN OLD RACE CAR FROM HERE IN SOUTH TEXAS ). The color of our J is Jamaican Blue....its really a blue green. He also had one tablespoon of gold & the same amount of silver flake added to the paint before it was sprayed.